BWSL & CWBL ordered to comply with order so as to provide adequate & quality water supply to Ambergris Caye. On Friday, July 28th the Public Utilities Commission (PUC), at a press conference held at the SunBreeze Conference Room in San Pedro, presented an order in response to a complaint made by the San Pedro Business Association (SPBA) against Belize Water Services Ltd. (BWSL) and Consolidated Water Belize Ltd. (CWBL). The problems commenced from early 2010 when the Easter week found many resorts and private residence with little to no water. On Friday, April 9, 2010 in light of the water issues, BWSL broke the silence when they held a press conference, once again, at the SunBreeze conference room. To discuss the issue was Mr. Alvan Haynes, Chief Executive Officer of BWSL who explained that BWSL is in the business of selling water but unfortunately since not much water was being made available to them by the producing company CWBL; BWSL had no alternative but to ration the water during the Easter holidays. During this initial meeting reasons for the problem were discussed and the development, which is still underway in the area west of CWSL, was cited as a possible cause for the problems with the membranes. Mr. Haynes went on to explain that CWSL had submitted water samples and their membranes to laboratories in the United States in an effort to find out where the problem lay. During that meeting, Mr. Haynes stated that in the interim, BWSL had requested from the Department of Environment (DOE) that any development in that area be halted until the results were completed. At the time The San Pedro Sun spoke with Mr. Jevon Hulse from the DOE who informed us that no such formal request had been submitted although there had been discussions in its regards. 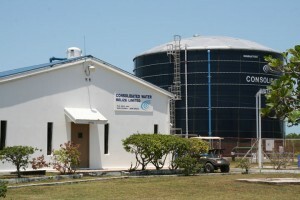 The problem persisted and on September 10, 2010 the SPBA filed a complaint to the PUC in respect to the quality and security of the supply of potable water to the public on Ambergris Caye by BWSL and CWBL. This complaint was based on the perceived deterioration of the quality of water supply to the public on Ambergris Caye, and observance of an obvious decline in the available treated water stored by CWBL at its storage facility. Chairman of the PUC, Mr. John Avery, along with Commissioner Ernesto Gomez and Director of Water and Waste Water Mr. Rudolph Williams were present to issue an ORDER made by the PUC cited as the San Pedro Public Water Supply Quality and Security Complaint Order. Both parties involved were given the opportunity to issue a formal response to the complaint submitted. A response was issued, however not to the satisfaction of the PUC. e) Deterioration of water supply by CWBL to BWS coincided with a substantial reduction in the frequency of the replacement of membranes at the CWBL treatment facility. 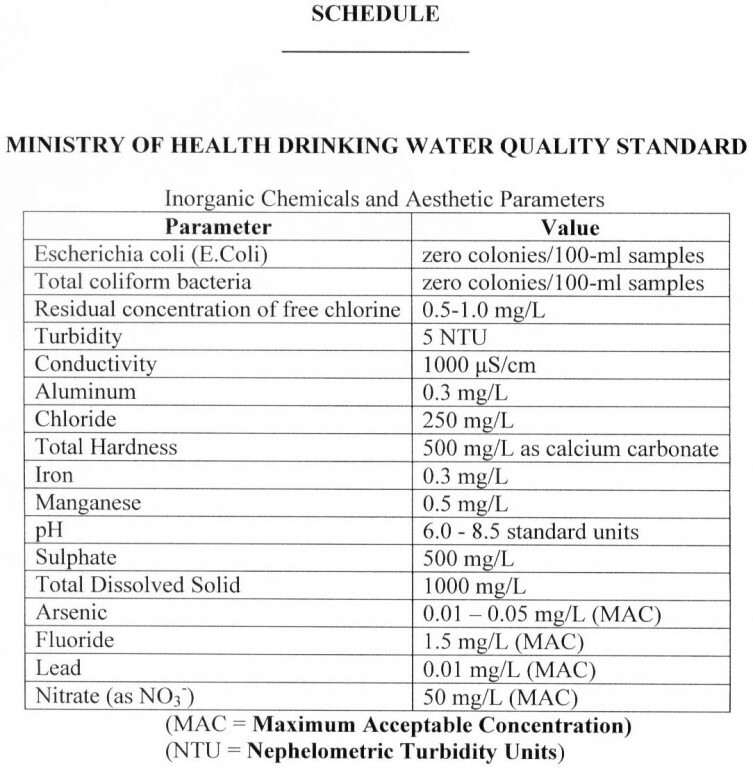 Chairman Avery informed those present that in some instances there was grave concern that the quality of water being supplied to the public was of a much lower quality than what was expected. 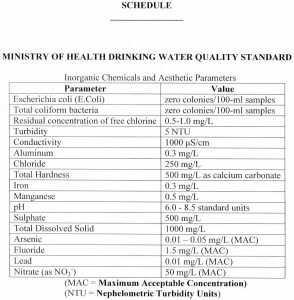 a) The quality of water supplied to the public on Ambergris Caye shall be governed by the values of the quality parameters included in the Schedule (Ministry of Health Drinking Water Quality standard - graphic below). (iii) Provide for CWBL to be the exclusive supplier of water to BWSL up to a maximum average of 450,000 US gallons per day. (v) Adhere to all relevant laws or Acts. * BWSL and CWBL shall comply with any and all written instructions from the Commission in regards to their rights and obligations under this Order. * CWBL shall, subject to any Operation Manual approved by the Commission pursuant to Section 2 (f) of this Order, maintain a minimum stock of twenty – four (24) unused membranes of a type and construction adequate for operation of CWBL’s water treatment facility. The Order came into effect on July 29, 2011. Present to receive the order were Mr. Herman Longsworth, Chairman of BWSL and Mr. Dee Dillon, General Manager of CWBL as of June 2011. Mr. Longsworth informed the gathering that as of recent, BWSL acquired one hundred and forty four acres of land in the immediate area surrounding the plant in an effort to protect the area. According to Mr. Avery, it is necessary that both parties adhere to the order and comply in full in order to ensure that a similar problem does not occur in the future.